Emblem: A dead tree above which is arrayed three white stars. Through the vile magic of the Necromancer, the Treegarth of Orthanc was poisoned, and the ents there corrupted into Voronodrim, Dark Ents, with malice in their heart, brambles for vines, and poisoned ichor for sap. They are led by the Brambleking, formerly known as Bregalad, or Quickbeam, once friend and ally of the Good Peoples, now a dire enemy and danger known as Bregambar, or Quickdoom. The Voronodrim of Nan Morëhón are currently embroiled in a “civil war” with the other ents for control of Fangorn Forest. The ents are still led by Treebeard, who has fallen into a terrible despair over the fate of his brothers. Due to the civil war (which moves, albeit at an entish pace, regardless of the recklessness of the Brambleking) the Brambleking has not been able to pursue his hatred of the other races, save to the extent where he has sent a few Voronodrim and huorns out to other forests to begin the process of corruption there. This includes forests in Eriador and Rhovanion, though not as yet in Gondor, as the Brambleking is wary of directly offending and thus gaining the full attention of King Elessar. The Treegarth of Orthanc is now known as Nan Morëhón, or Blackheart Vale. The Watchwood is much expanded, to fill the entire vale, and is now known as the Bramblewood. The lake about Orthanc is now a silted, festering swamp, while the tower itself, a creation of man, displeased the Brambleking so much (especially in that it could not be destroyed despite his new power and magical arts) that he grew the entire thing over in vine and thorn and branch, such that it now looks like a colossal dead black tree, with four huge branches grasping at the moon, the whole covered in bloody vines (from which hang the rotting bodies of men and elves). Orcs once again inhabit the tower and the slimy dungeons beneath it, doing the bidding of Quickdoom. His employ of orcs has dragged him into the politics of that vile race, and he plots now for his tribe to overthrow the Moria Orcs and take that realm for his own, the wealth and power thereby gained the better to conquer (and extirpate) the other races of Middle Earth. 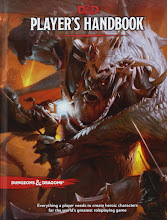 For all that he had a hand in the creation of Nan Morëhón, the Brambleking, and his followers, the Necromancer is at best a distant ally and at worst a future rival, and thus the relationship between Quickdoom and Pallando is strained at the best of times. Emblem: A red dragon rampant. Dhumujian was born 33 years ago amongst the Variags of Khand, during the chaos and wars that followed the fall of Sauron and the disintegration of the Dark Empire. He was born a normal human, son of one of the many tribal chieftains. His father and most of his tribe was slain when he was but a child, and he fled into the wilderness. There he slowly built his own tribe from outcastes, the disaffected, and orphans like himself, welding them into a new tribe and power. Two years ago his tribe conquered the last remaining Variag tribe that opposed him, and he celebrated by naming himself the King of the World, and proclaimed himself a god. The High Priestess of Khand thereupon prophesied that he would either be destroyed for his presumption or he would, in fact, succeed, and be both god and king. 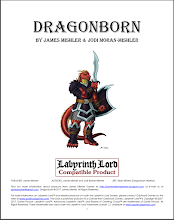 Shortly thereafter a dragon began ravaging the countryside in a terrible rage, and all thought that it was the vengeance of the gods for their leader’s blasphemy. Dhumujian went forth to meet the beast single-handed. Naught was heard from him for three days, but the dragon was not seen again. When he returned, the khan was a changed man. When he slew the dragon its blood spilt over him and changed him in ways terrible and magical. Unbeknownst to him or any other, the reason the dragon raged so terribly was that it had eaten a ring from its hoard, a ring of power, and the smelting of it in its belly drove it mad. When the khan slew the dragon, its magically-charged blood drenched him and altered him through the magic of the ring. It transformed him and gave him no small measure of the dragon’s power (effectively turning him into a half-red dragon). Today his followers are fanatical to the extreme, believing the transformation to mark the approval of the gods and the eventual conquest of the entire world under the hooves of the Variag peoples. Emblem: A white dragon rampant. Helkanárfëa, the Ice Queen of Angmar, is the daughter of a balrog and a captured Noldor princess of the First Age, born in the pits of Morgoth. Thus, as with Lúthien, daughter of Thingol of Doriath and Melian the Maia, she is a most potent being. She was being trained as a great captain by Morgoth when the Final Doom fell upon Angband and her master, but she survived, and was cast into the waters of the north, where, due to her great might from her valaraukar father, she remained frozen alive, encased in ice for millennia. Even frozen in body she was potent in spirit, and over the ages she slowly corrupted nearby native tribes of elves, men, and orcs to her cause. When Sauron was destroyed the great wave of magic that was released in his destruction shattered her prison, and she was freed. Since then she has slowly built her forces of Helkari (vile ice elves), Lossoth (evil snowmen), and Akûlmurûk (“ice bears,” the mighty furred orcs of the north). Around 30 FA her first scouts snuck into Angmar and made contact with the local goblin tribes. By 50 FA she had conquered the orcs of Mount Gram, and controlled or otherwise dominated all other local orc tribes and troll bands, save those of Mount Gundabad (who oppose her and, thus far, are too strong to conquer). By 60 FA her new domicile, Lugrazbûrzum, the “Tower of Frozen Shadows,” was complete, built atop the ruins of the Witch King’s tower at Carn Dûm. Angmar is now a fairy land of ice and snow, where summer is as autumn and spring never reigns. It has become known as the “Fimbul Land,” for orcs and trolls walk the frosted moors by day and ice and frost giants are said to stride the land by night. The Ice Queen appears not unlike a beautiful Noldorin princess of old, being 6’8” tall, with platinum-blonde hair, beautiful elven facial features, and fine slim hands. Her resemblance to Galadriel is stunning, though not so when one realizes that her mother was none other than Galadriel’s long-lost sister (she is thus great aunt to Elladan, Elrohir, and Arwen, and kin to Prince Eldarion of the Reunited Kingdom). However, beneath her voluminous flowing robes of scintillating colors (which glow like the northern lights) her body is foul and demonic, covered in innumerable ice-blue scales strong as dragon plates (think of the appearance of Mystique in the X-Men movies). These scales go all the way up to her neck and to her wrists, and thus does her robe; her feet are clawed and demonic, and so she ever wears slippers of mithril and gold. The only obvious (uncovered and un-disguisable) demonic elements of her appearance are her eyes, which are a solid blue, the glowing blue of glacial ice, and her wings, which appear as those of a balrog, though ice blue in color and dripping with ice. She can “scrunch” her wings to vestigial size, and hide them under her robes when necessary, though the process takes three full rounds. The air about her is ever cold, deep frozen as the north (-20 degrees Fahrenheit); her breath freezes in a cloud of ice as she speaks, the stone floor slicks in ice under her feet, and icicles form on the arms of her throne as she sit upon it. She travels about her realm in a sleigh drawn by polar bears and manned by Lûzolog (snow trolls) and Akûlmurûk. The Ice Queen possesses one of the lost Palantír, one of the two lost to the sea when the White Ship of Arvedui, the Last King, foundered. It is encased in a large column of blue glacial ice now hidden deep in the bowels of her tower at Mount Gram. It has gained several powers through her tampering with it and through its long centuries encased in the northern ice. The Palantír can only just be made out through the deep blue ice, flames writing continuously within its dark depths. The visions granted by the Palantír now take shape within the column of ice, and can be seen by anyone who sees the column of ice when the visions are evoked by the user. It is also central to her growing power over the climate and weather within Angmar, as she uses it as a focus and amplifier of her power. The Ice Queen has allies among the Forodrim of Forochel, who are currently whipping the locals into a murderous frenzy against the southerners. She seeks to send the Forodrim on a viking rampage against the Grey Havens at Lindon and the coastal territories, perhaps even against Dol Amroth and other Gondorian territories, or into Eriador up the Baranduin, Gwathlo, and Angren. The Forodrim are Northmen, of the same line (though long sundered from) the Rohirrim, Beornings, and Woodmen. They are tall and grim, silver and grey of beard and blue of eye. They are not related to the Lossoth and despise the peace-loving nomads (though they grudgingly cooperate with those that follow the Ice Queen). Emblem: A dragon skull with blazing red eyes. Pallando, the junior Blue Wizard, returned out of the east in 60 FA, conquered East Lorien using a Black Wind, and re-occupied Dol Guldur, claiming the title, The Necromancer, for his own. He now commands an army of Woodmen skeletons, zombies, and ghouls. Clad now in deepest black, he has developed terrible magic whereby he can trap the spirit of an elf and corrupt it to create a banshee or elven ghoul. He has several allied Easterling tribes which have recently begun moving west. With them he has begun raiding the lower vales of the Anduin, the Iron Hills, and Dorwinion, not yet feeling he has the power to challenge King Elessar in his heartlands in Gondor or Eriador. So in addition to the campaign I am running in the Wilderlands of High Adventure, I am also going to be starting a campaign set in a Sword & Soul campaign setting. Sword & Soul is a subgenre of Sword & Sorcery, dedicated to stories/games set in Africa. Sword & Soul originated in the works of Charles R. Saunders, the author of the Imaro series. 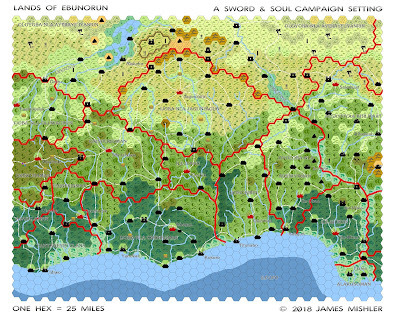 Ebunorun grew out of two factors: first, my great enjoyment of the Imaro stories, and second, a friend of mine who wanted to play some Dungeons & Dragons, and he wondered, as an African American, if there were any African campaign settings that did the region justice (and matched the style of play we wished to play). After perusing a number of them, I determined that it would be best to go forward with developing my own Sword & Soul Campaign Setting, ergo, the Alternate-Africa setting of Ebunorun. 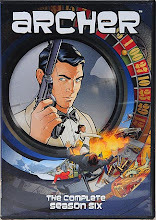 I must note that the Ki Khanga RPG is very interesting, and was strongly considered; it does not come better in the realms of Sword & Soul than a game designed by the writers who work with Charles Saunders! 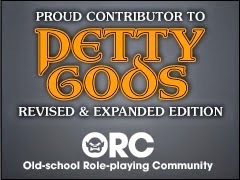 However, the campaign setting is still much in the works, and the system for the game is unique; with everyone wanting to play D&D, it is something to be considered for the future. The map is inspired by the Alkebulan "Africa Uncolonized" map, found here. I should note that the names of the locales were constructed using an English-Yoruba translator; in the history of Ebunorun, the Adeniya (E-Yoruba) Empire was much larger and left a much more lasting effect on these realms, such that the "Common Tongue" of the region is derived from the Adeniya tongue. The map is below. I am working on a brief player's gazetteer that should follow, soon-ish. We hope to begin the campaign in February. Click here for a larger version of the map on Google Drive.